Dogs may be man’s best friend, but if you spend enough time in an emergency room you’ll eventually see someone who is suffering from a dog bite. In the United States, approximately 1,000 people rush to their local emergency room to be treated for a dog bite injury every day. Additionally, dogs bite more than 4.7 million people in the U.S. every year. A dog bit me. Who is responsible? In California, dog owners are held strictly liable for the injuries and damage their dog causes. This means that dog owners are liable regardless of whether they knew the dog was dangerous or not. Ultimately, in many cases the dog owner’s homeowner’s or renter’s insurance will cover the physical injury and property damages caused by the dog. A victim does not have to prove that the owner was reckless or negligent. Dog owners take note: no matter how careful you are in making sure your pet doesn’t hurt anyone, you are still liable in the event that your furry little friend ends up biting someone. 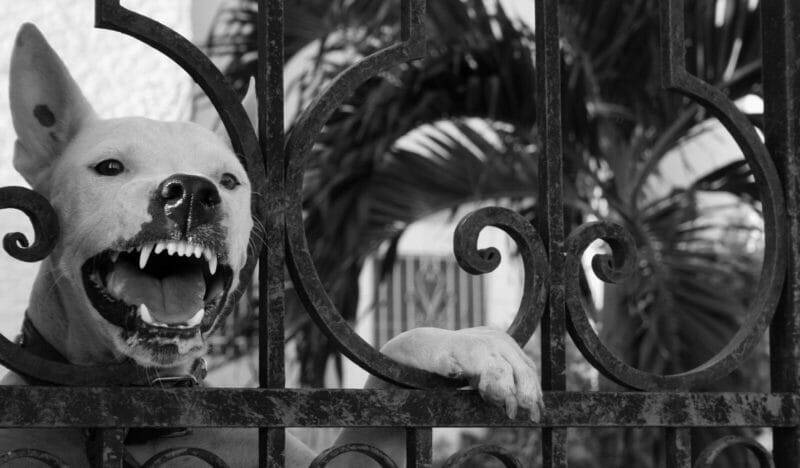 Many other states operate under the “one-bite” rule, which means that the owner is only liable if they knew the dog was dangerous or likely to bite. A dog bit me. What do I have to prove? That a dog attacked you and caused your injury. Note: You can recover even if a dog doesn’t bite you. For example if a dog attacks you, chases you into the street, and causes you to get hit by a car, then you may be able to recover against the dog owner. Who the owner of the dog is. You didn’t provoke the dog to bite you. You had the right to be where you were (i.e., not trespassing). My dog bit someone. Am I responsible? In California, you are responsible for the personal injury and property damage that your dog causes whether or not you knew that your dog was dangerous. However, recovery may be denied and you may not be responsible when: 1) the victim provoked the dog, 2) the victim was trespassing, 3) the victim assumed the risk or 4) the victim negligently caused the dog to attack. My dog was provoked. Am I still responsible? If your dog was provoked to bite, you may not be responsible for the damage that was caused. A dog can be provoked in a variety of different ways. For example, taunting, teasing, hitting, holding, pulling, and grabbing a dog are all ways a dog can be provoked. A dog can even be provoked through innocuous actions. For example, if someone trips over a dog or a child hugs a dog and the dog retaliates, it is possible that the dog owner will not be held liable. Someone was trespassing on my property when my dog bit him. Am I still responsible? If your dog bit someone who was trespassing on your property, you may not be held liable under the California dog bite statute, however, you may be held liable under a theory of negligence. People are considered trespassers when they are not invited to go on your property. If you do not inform people that you do not want them on your property, it could be construed that they have an invitation by implication to come on your property for everyday occurrences (i.e. ask for help, ask for directions, solicitations, community outreach). Therefore, if you have a dog in your yard, it is a good idea to warn them off your property with signs or locked gates to protect yourself against any potential lawsuits. A dog owner is not liable for the injuries their dog causes if the victim assumed the risk. This means that the injured person had knowledge and appreciation of the risk involved, and voluntarily took that risk. For example, a person assumes the risk if he knowingly enters a yard that contains a dangerous dog. A person is deemed to have known of the risk involved when he is warned of the dog’s dangerous propensities (a verbal warning or prominently posted sign is sufficient). My dog bit the groomer/trainer/veterinarian. Am I responsible? People who work with dogs (groomers, sitters, trainers, and veterinarians) are presumed to have assumed the risk of injury. This means that generally, a dog owner will not be held liable for the injuries their dog causes against these types of people. In Priebe v. Nelson (2006), the court held that everyone who handles dogs for a living assume the risk of getting bitten while the dog is in their custody. However, the dog owner must inform the professional if the dog has a dangerous propensity. Further, if you are taking care of a friend’s dog and the dog bites you, you will not be able to recover against your friend because once you have taken over control of the dog, you are assuming the risk and assuming responsibility of controlling the dog. I was taking care of a dog, and the dog bit someone. Am I responsible? If you’re not the owner of the dog, but the dog bites someone while you are taking care of him, you may be liable for the injuries the victim sustains if you are aware of the dog’s vicious propensities. “A keeper, in contrast to an owner, is not an insurer of the good behavior of a dog, but must have scienter or knowledge of the vicious propensities of the animal before liability for injuries inflicted by such animal shall attach to him.” (Buffington v. Nicholson (1947)). My dog bit someone who stepped on my dog’s tail. Am I responsible? California is a comparative fault state. This means that a plaintiff’s recovery is reduced by their proportion of fault. For example, imagine that the plaintiff tripped over a dog, the dog bit him, and the plaintiff incurred $1,000 in medical expenses. If the plaintiff is found to be 40% at fault, the plaintiff’s recovery will be reduced by 40%, which means that the plaintiff would only be able to recover $600 for the medical expenses. If a dog bit you or a loved one, don’t delay. You need to call an attorney as soon as possible. Lem Garcia Law can help you get what you deserve. (626) 337-1111.